October 15, 2016. By Michelle Baltazar. AF Sept 2016. From the films “Interview with a Vampire” and “Twilight” to hit TV show “True Blood”, the fascination with vampires and werewolves is firmly entrenched in today’s pop culture. But what many people don’t know is that when it comes to mythical monsters and enchanted beings, the Philippines is a treasure trove of stories that is hard to match. From the aswang (shape-shifting vampire) to the kapre (tree giant), duwende (dwarves), ‘white lady’ and tikbalang (half-human, half-horse), the list is long and the scary encounters with them have been passed on from one generation of Filipinos to the next. But what happens when you move to another country? Do Filipino-Australian migrants still believe in the aswang or the nuno sa punso (goblin)? 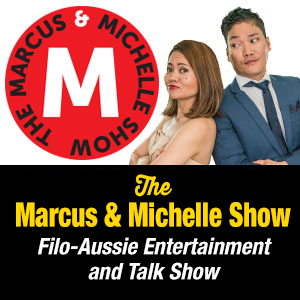 This is the topic of discussion in the second-last episode this year of Sydney-based community TV show, The Marcus & Michelle Show. The special episode will explore this part of traditional Philippine folklore in a talk show program featuring guest interviews, performances, comedy sketches, games segment and audience participation. The show’s producers also want to encourage the audience to dress up for the Best in Halloween costume competition and give-aways. The live taping will be held from 4pm-7pm, October 23 (Sunday) at the Greater Western Sydney Performing Arts Centre (141 Hyatts Road, Plumpton). Entry ticket is just $20 and Filipino snacks and drinks will be available for sale at the venue. For media or ticket sales enquiries, please contact Violi 0408 227 794, Pines 0404 631 438 or Michelle 0412 906 224.